Our operating hours are from 8:15 am to 4:00 pm Monday through Friday. You can reach us at (253) 838-3604 or by email. The Walk for your life March walks schedule has been posted. Every year our community helps those in need celebrate the holidays. Holidays at our Federal Way Senior Center / Food Bank / Nutritional Meal Program are a very special time thanks to the support of our very generous community. The center is dedicated to improving the lives of seniors, families, children and individuals of all ages. 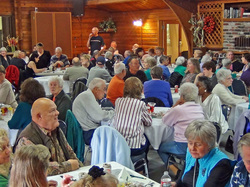 The Senior Center offers a warm comfortable atmosphere in our log cabin clubhouse where friends can enjoy good company, live music, singing, dancing, lunch and learn programs, holiday celebrations, parties and other weekly activities. They also participate in our buffet breakfast, tasty lunch, Food Bank, Community Garden, Thrift Shop, computer lab and bingo. The Federal Way Senior Center offers a wide variety of events, classes and fitness activities. Read below for more information about our programs. Activities: We have many fun activities throughout the week, so be sure to visit our Activities page. Find something that sounds fun and stop by! Or, join us for lunch (just a suggested donation of $3 for members; $4 for non-members), a game of pinochle, exercise classes, road trips and more! Click here to see our weekly activities page. Computer Classes: Computer classes at the Senior Center are offered to area adults regardless of age. Classes are not limited to seniors and you are not required to live in the area. Courses are designed for PCs (vs Apple products), and include Beginners, Windows Operating Systems, M/S Office, Internet, email, and more. Click here to view our Adult Computer Classes and class schedules. Walk for Your Life: Walks sponsored by the Center provide good exercise activities for seniors and are held every Tuesday, rain or shine. Our walks last about 2-hours and cover about 3 to 4 miles. Many include a lunch stop. Visit this page for a list of future walks, difficulty ratings, costs and lunch plans. Click here to see our upcoming walk schedule. Rent the Center: Our facility is in a rural setting, has plenty of parking and can be rented for one hour to a full day. The facility is great for anniversary celebrations, retirement parties, weddings, birthday parties, graduation parties, and organization meetings. Special arrangements can be made for organizations wishing to schedule regular weekly or monthly meetings during the day or evenings. Click here for more information about renting the Senior Center. Food Bank: The Federal Way Senior Center is very fortunate to receive donations of breads, pastries, meats and produce from Trader Joe’s, Safeway (288th and Twin Lakes), Costco, Winco, and other donors. Picking up items 7 days per week, our drivers generously give their time to bring back, unload, sort and store these donations. The Food Bank is open Monday and Thursday mornings from 8:15 to 11:00 am for needy individuals/families in the zip codes of 98001, 98003. and 98023. We serve as many as 120 families per week. Extra bread and pastry products are taken to low income housing facilities. Please re-member that the Food Bank is meant for those in need. Thrift Store: Our thrift store, the “Treasure Chest”, is usually open every Monday and Thursday from 8:15 to 11 am. One of these days we hope to have some heat in this out building which will enable us to keep our primary thrift store open for much longer periods of time. We also have our “Traveling Treasure Chest (the table just inside the Center’s front door) open on most weekdays from 8:30 am to early afternoon. Be sure to come in and browse and, of course, shop. There are lots of goodies available for a usually small donation. Remember all the proceeds go to benefit your Senior Center. Medical Equipment If you or a loved one requires medical assistance gear, we may have the following selection of items available for you to borrow for a small loaner fee of $10.00 per item. Please call the Center to see if we can meet your needs. We do not loan equipment we know to be defective but we take no responsibility for the safety of these devices. Senior Rights Assistance: A trained volunteer is available on the first Thursday of the month by appointment to offer information about Advanced Estate Planning, Durable Powers of Attorney for Financial Matters, Health Care, Wills, Living Trusts and Probate. Please call the center to schedule an appointment. Please see Char if interested or call (253) 838-3604. Your help is really needed. Thank you! The Senior Center is located at 4016 South 352nd Street in Auburn, WA 98001. Driving directions and a map are below (click here to see a Google map). From Federal Way: drive east on S 320th Street east over the freeway and turn RIGHT at the light onto Military Road. Then turn RIGHT onto S 352nd (just before the ball fields). Drive about 1/2 mile. You will see our sign on the right side of the road, just past 42nd Avenue S.
From Auburn: take Peasley Canyon Rd west to the traffic light at Military Road; turn LEFT onto Military. Then turn RIGHT onto S 352nd (just before the ball fields). Drive about 1/2 mile. You will see our sign on the right side of the road, just past 42nd Avenue S.
From I-5: take the S 348th Street exit to Hwy 18 and immediately take the Weyerhaeuser Way exit, turn right at Weyerhaeuser Way and immediately turn left onto 344th Way. Turn right on 38th Ave and then left on South 352nd Street. Watch for our sign on the left.